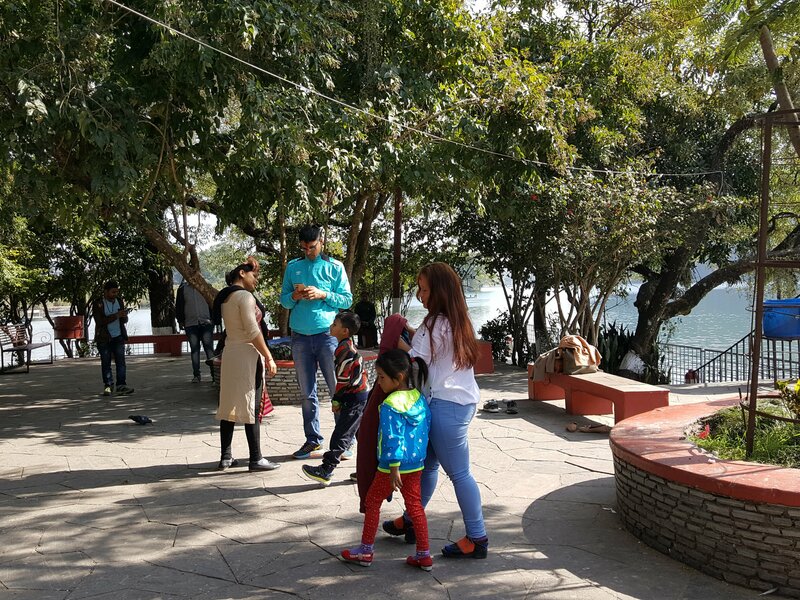 After checking out some stuff at the Tibetan Mini Mart, I head to the larger boat dock by the Winter Palace at Fewa Lake mid-morning where the Nepali go. 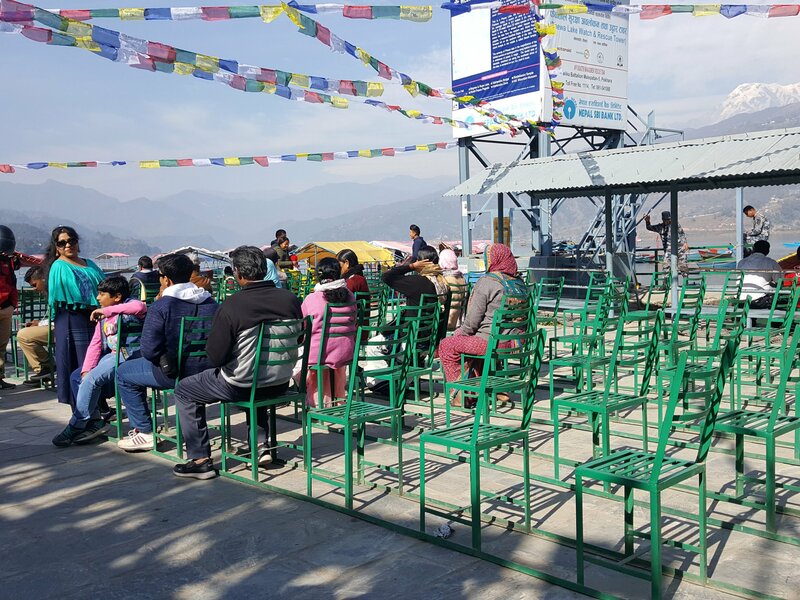 Compared to the smaller one by Hotel Fewa, this is busier and has more boats. 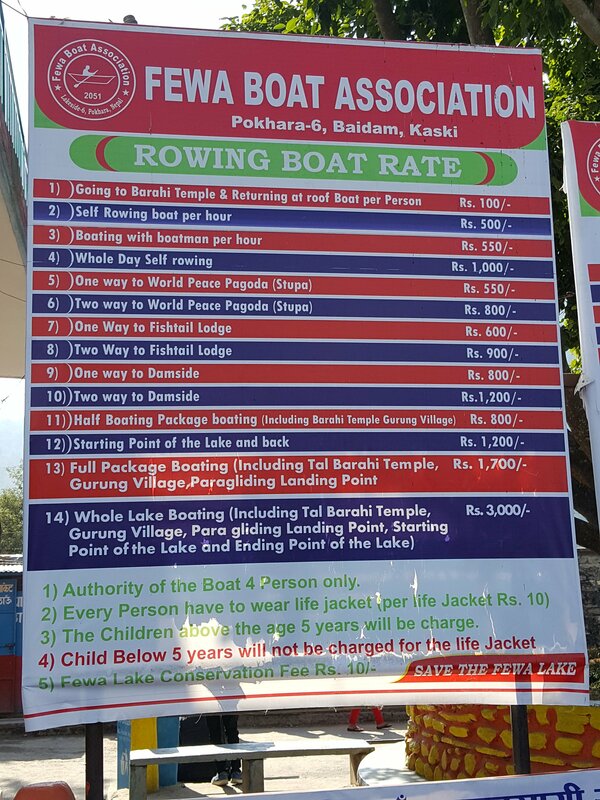 I pay NR 800 for a trip to the Gurung village and the Bahari Temple plus NR 20 for the mandatory life jacket (IMHO, the life jacket should be free already). After getting the life jacket from the shack behind the ticket counter, I present my yellow ticket to one of the guys in official-looking vests hanging around the boat dock. While they are sorting out who would take me, a cocky looking young man who says he’s the boss comes forward and offers an additional NR 400 to go all the way to the starting point and back with a guarantee that should the boatman not do it, I can get my money back from him. I pay and he talks to an older guy who points me to a small boat. We head out of the dock and into the center of the lake. 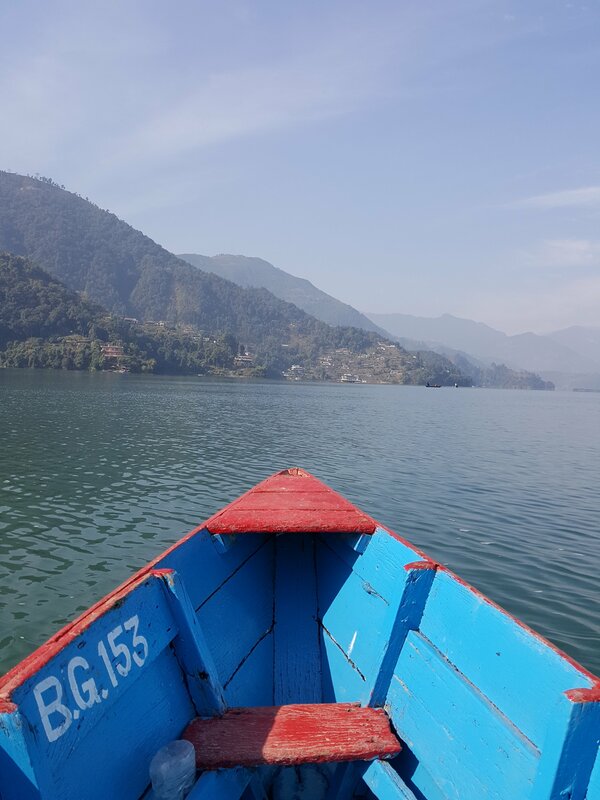 With a smattering of English, the boatman points our route– Gurung village and Bahari temple following a circular path. 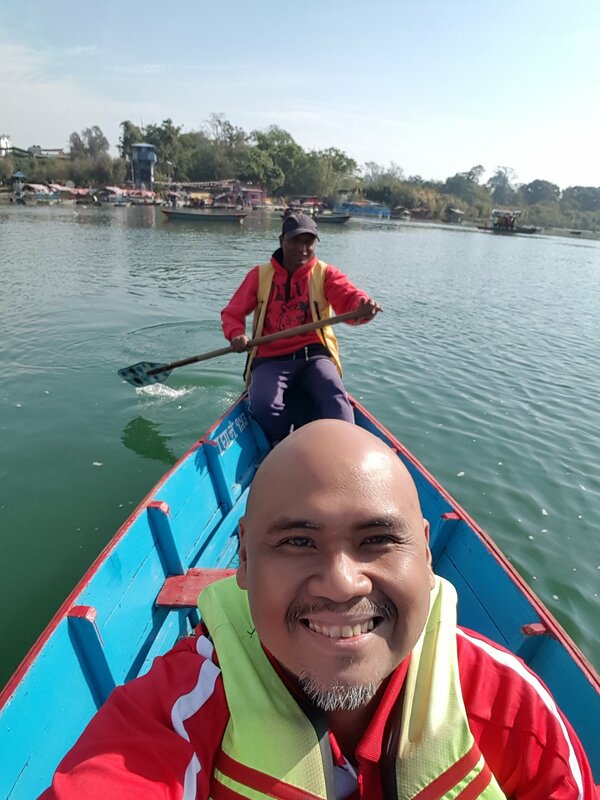 He steers the boat to the landing point for the World Peace Pagoda. 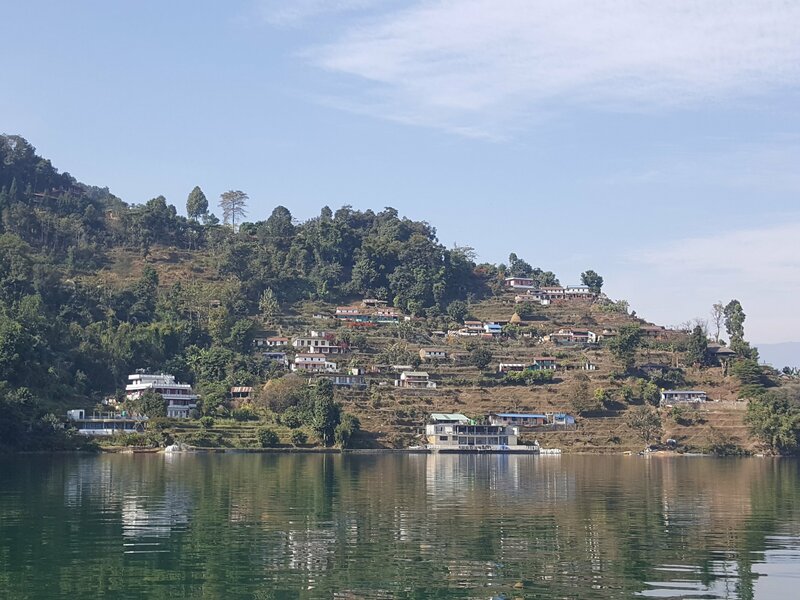 I tell him we are going to Gurung Village and he as answers it’s the landing point from which I can walk to the part of the village by the lake’s edge. 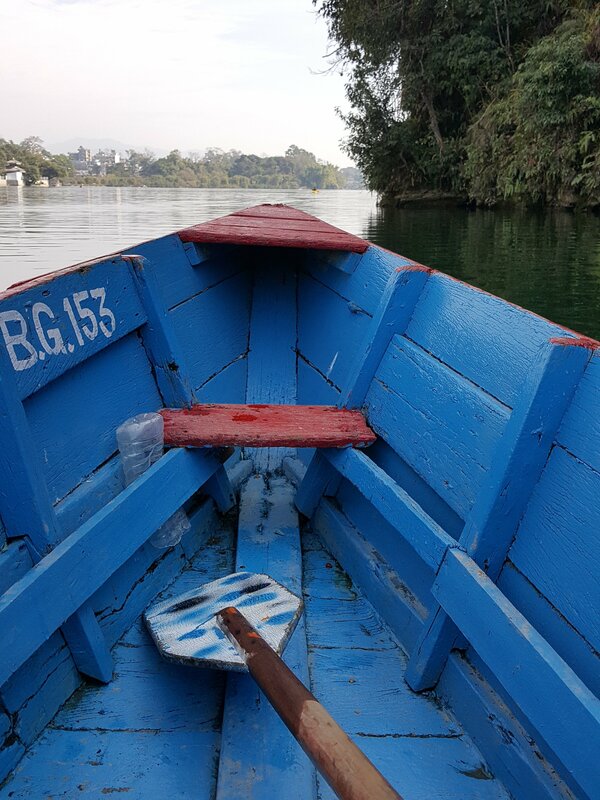 The village doesn’t seem to be too interesting so I decline to get off the boat. I tell him we are going to starting point and he points out a spot just past the village. Somehow I feel that starting point refers to the smaller boat landing way further than where we are. Somehow, I feel I’ve been scammed by the “boss” at the dock. At that point, it makes no sense arguing my itinerary. Anyhow, I got my breathtaking Annapurna views. Saw lots of fishes too swimming near the water’s surface. I ask if I could try paddling and he hands it to me. I paddle following the contour of the lake edge. Not really hard work, very calming actually. 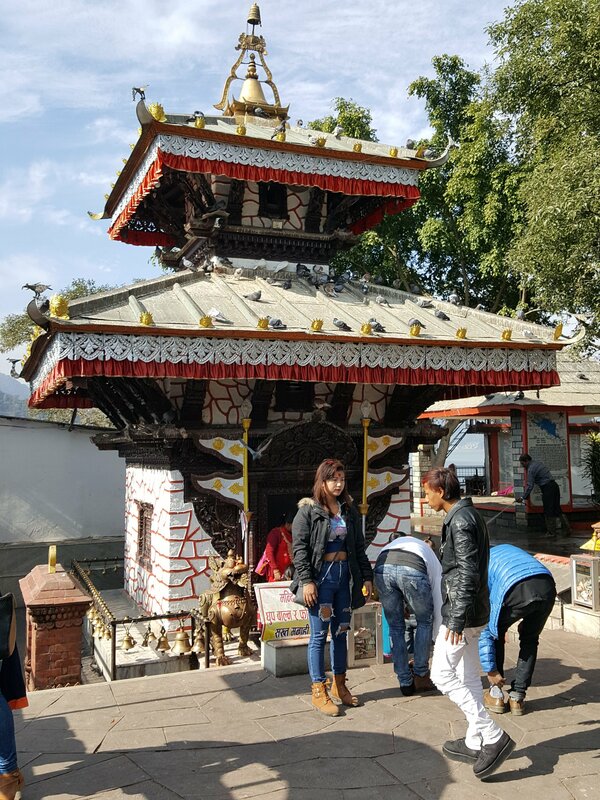 He notices I am heading straight rather than steering left to Bahari Temple and tells me that I would need to pay more if I were to continue as it would lead me to the royal palace which is further up. I steer to the left. 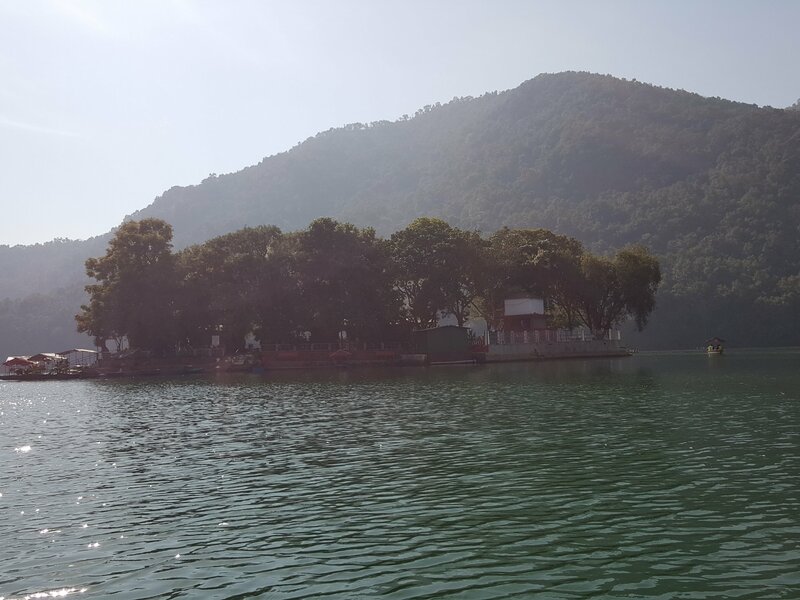 Bahari Temple is in the small island a few hundred meters from the boat dock. There’s a small shrine and lots and lots of pigeons, many nesting on the trees. There’s a small area with benches though the best spot would be the ones on the dock facing the mountains. 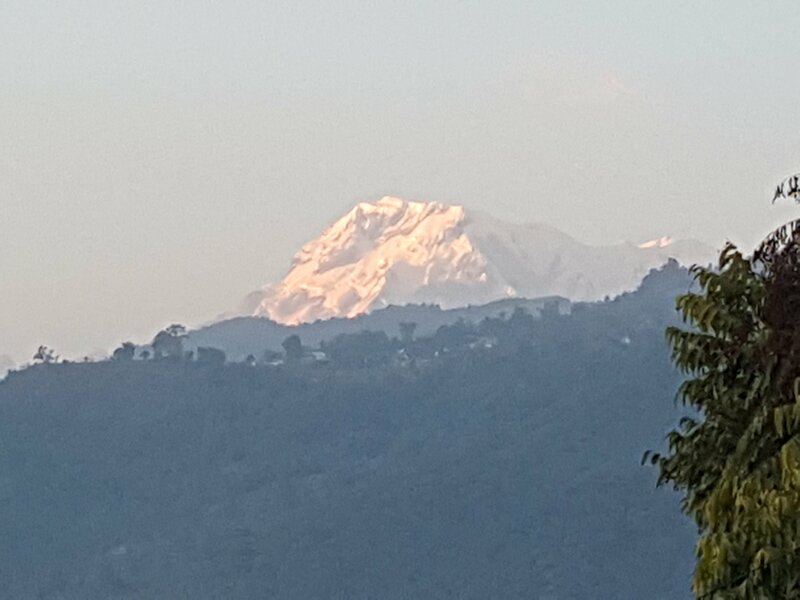 Nothing much to do except to admire the view of the Annapurna mountains. I let him paddle the boat back to the shore. I step off and hand him a NR 200 tip. Of course, the “boss” is nowhere to be found. 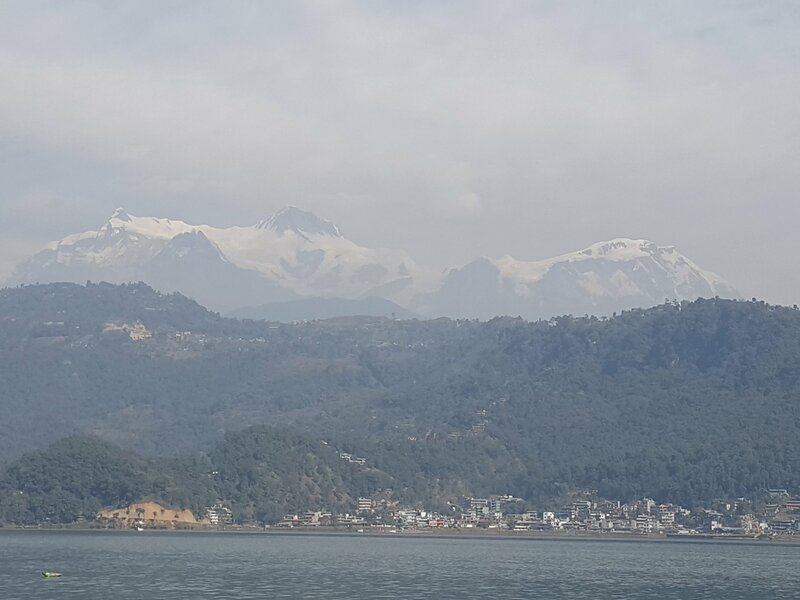 Arrived at Lakeside in Pokhara after a 7-hour journey from Kathmandu. The trip was better than expected. Took a taxi (NR 300) from the tourist bus park to the hotel located at a side street just a few minutes walk to the lake. Got to choose a 1st floor room at Hotel Celesty Inn which is a welcome break from my 3rd floor room at Avalon House in Kathmandu. Nepal designates the ground floor as ground floor while 1st floor is the 1st floor up unlike in the Philippines where ground floor is 1st floor. The family who owns and runs the place were really friendly and warm. The wife even came out front when I got off the taxi. You know that fuzzy feeling when you arrive at a place and are so glad you decided to come? 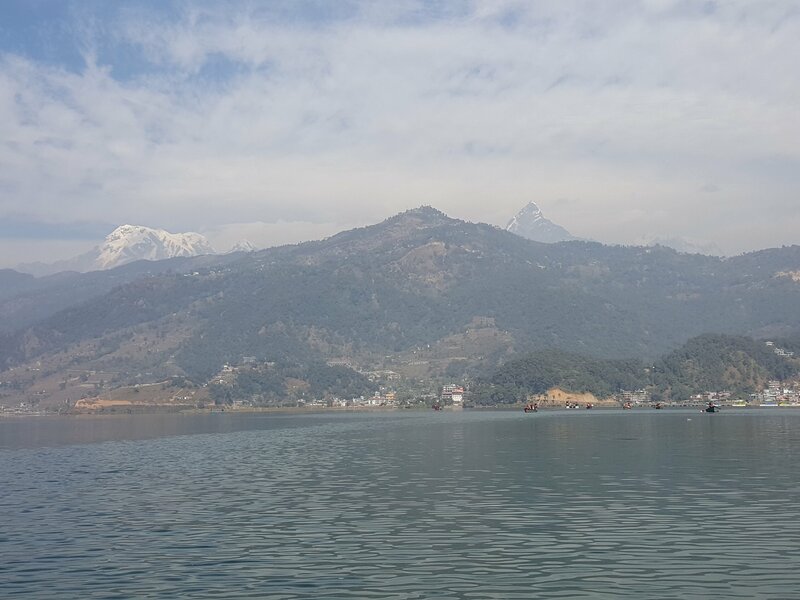 I felt that in Pokhara. Where else can you see glacier mountains from the street? 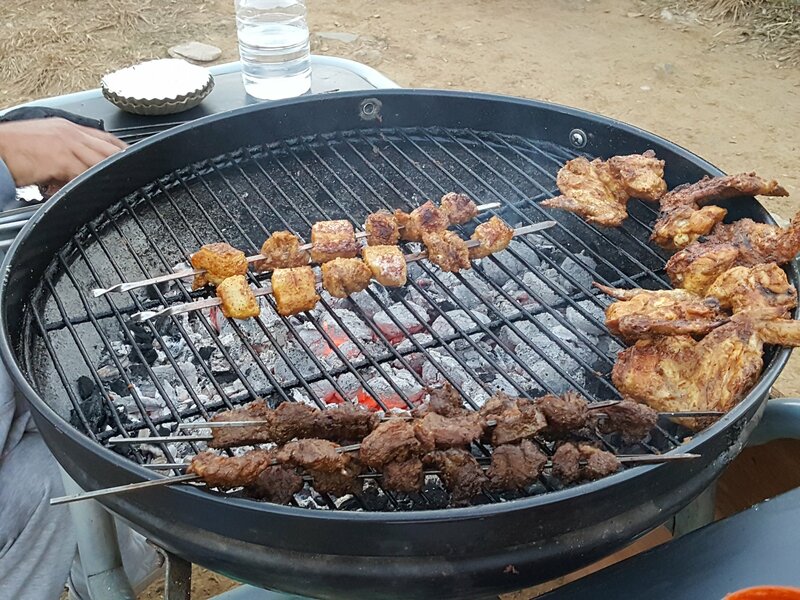 Went to the lake for a walk and had a really tasty pork barbecue Nepalese style for only NR 100 per skewer. 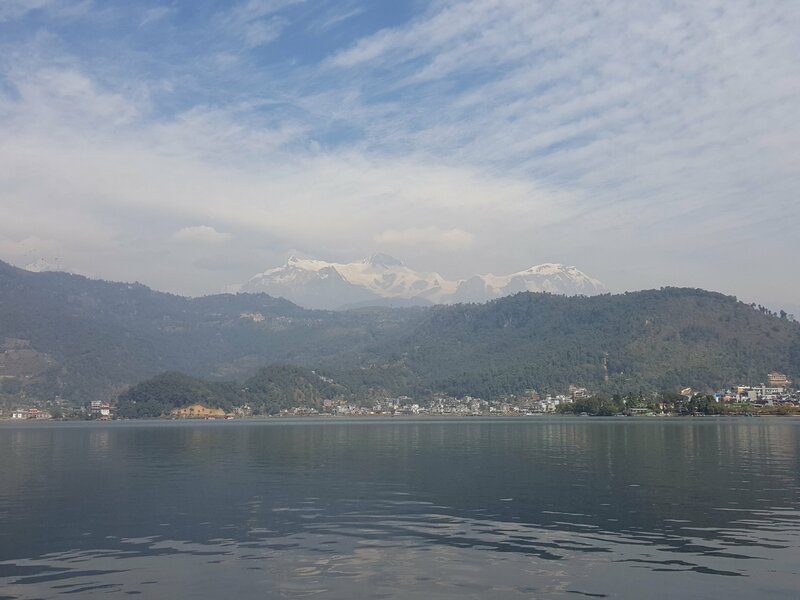 I’ve not yet thought what to do in Pokhara. I’m just so glad to have come here.